It’s that time of year again where people don their wigs and cloaks in the name of candy and celebration. But don’t think you have to be a vampire, witch, or mummy again. For those of you artistically inclined, here’s nine costumes no one will see coming. Feel like semi-smiling this Halloween? 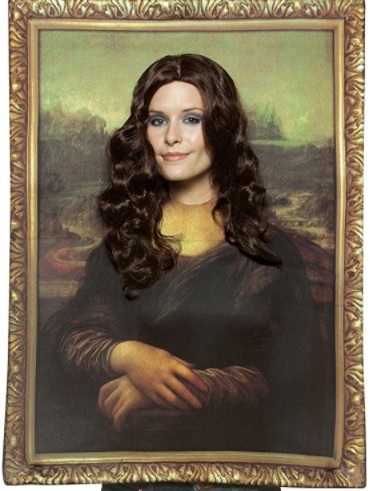 Frame yourself as Da Vinci’s famous lady for all those photo ops. It seems like this would be somewhat easy to make. Get creative and paint your own canvas or foam board, and cut a hole for your debated facial expression. Or just buy one here (but you’ll also need a wig). For those wanting a subtle artistic presence, you can never go wrong with a graphic tee. Depending on exactly how much effort you want to put in, this simple shirt gives the flexibility of whatever look you’re going for, be it the creepiness of a zombie, ghoul, you name it. The creators of this design have them available for a variety of occupations as well. (Low-key group costumes, perhaps?) 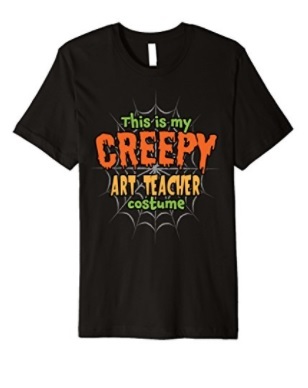 There are many variants on this ‘Halloween Art Teacher’ theme, so be sure to look around. Embrace happy little accidents with this rather simple but beloved costume. All you need is the wig/beard combo with a paint set, along with jeans and a button up shirt, and you’re all set to “beat the devil” out of some paintbrushes. Now go paint some happy little trees. Love Bob Ross but don’t like fake beards? 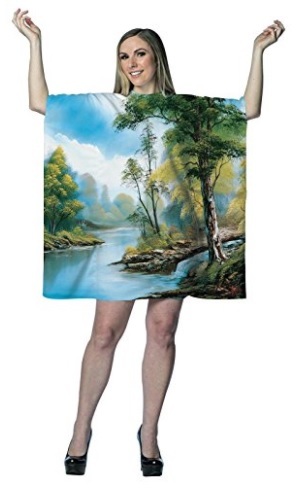 Take things one step further and become his painting. I couldn’t believe this was real when I first saw it, but here it is: the opportunity to be your own happy landscape. Is art separate from the artist, or are they the same? Is the canvas the artist, or the artist the canvas? 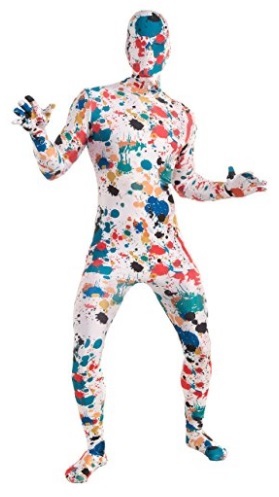 …Anyways, among the more, er, odd options, you could go abstract with this “disappearing man” suit. But hey, if spandex and paint are your thing then go for it. If anonymity is something you’re looking for this Halloween, this get-up provides that as well—despite the lack of breathing room. Go back to kindergarten with this 24 set of crayons. With this costume you rule the box, and show everyone who loved art as a kid. With the rainbow assortment and yellow box, you’re sure to also evoke nostalgia from those around you. Individualize yourself as a single Crayola color in this artsy (and dorky in the best way possible) get-up. Going with a group of like-minded friends? This one makes for a fun group costume, as everyone can pick a different color. Morph into an early 20th century painting with some simple makeup. Picasso is most known for his asymmetrical take on the human form, as well as his eclectic choice of colors. Thankfully for those in costumes, that means it’s not too difficult to pass as one of his paintings come to life. Simply take reference from his great works, or put your own creative spin on it like the girl in this video. And when it comes to mistakes, chances are misplaced or oddly drawn lines will only add to the effect. Take this list as a means of inspiration. There are countless artworks, artists, and art supplies begging to be turned into costumes. Well, maybe not begging, but they’d make for fantastic and memorable looks all the same. Happy Halloween! You know the feeling: you’re waiting in a checkout line, glazing your eyes over the tabloids and cooking magazines placed around the candies and register. Nothing particular interesting, and all you can do is shake your head at the front pages of celebrity alien babies and other oh-so-realistic scandals. When I was about nine years old, though, I loved the holiday cooking collections. Little books of themed recipes, dotted amongst the gossip, their covers always had some cute or intricate design. I distinctly remember one booklet that featured a haunted chocolate cake and creamy looking ghosts. After much insisting (and let’s be honest, some begging), it was purchased for me. The recipes included non-alcoholic cocktails, cupcakes, snacks, and yes, those adorable cookie ghosts. Although I kept wanting too, my family and I never quite made the time or had the motivation to cook them. Until now. Finally, I made the meringue with help from my mom, a good cook and baker. It was a fairly simple process: make the meringue (perhaps not so simple itself), pipe it into ghost shapes on a floured baking pan, place little chocolate chips for the eyes, and bake. Only a few of my ghosts looked like those on the cover. Initially it was a little frustrating, as the meringue didn’t stick to the pan enough to shape; instead it was dragged around with the tip instead of staying in place. It was for the better, though. Because they all looked different, they developed their own personalities as individuals. That may sound strange, but it was fun to try and pipe one thing, and see them end up in unique ways. Besides the ghosts, I also attempted to do more traditional meringue shapes. My mom called them “little poos”, and I’ll happily admit many of them have a certain, unintentional resemblance to the poo emoji. Inspired by some mega meringues I saw while in Assisi, Italy, I tried to make some large ones. Mine were really sad in comparison, so I gave them their own faces with the chocolate chips. They evolved to a more ‘melted snowman’ look. Somewhat surprisingly, they actually came out really well. Well, the ghosts and little poos *ahem* meringues did. The large ones, which were experiments anyway, were a little chewy in the middle, but were still enjoyable. The top left one vaguely reminded me of a dianoga, a.k.a. the Star Wars trash compactor monster. We agreed this ghost in the middle had a resemblance to a Dementor. Here are three that I feel most match the original ghost design. Again, this was a fairly straightforward project. It would be neat to make the full project like the cover, placing the ghosts near, or maybe even floating around, a haunted house. I could see doing this other Halloweens, or maybe dying the meringue pink and making hearts on Valentine’s Day. Have you ever made meringues? How did it go? Let me know below!